The Baltic Sea has had a dramatic geologic past, complete with advancing and retreating glaciers and shifting inputs of fresh and salt water. All of these changes are recorded in the layers of sediments that collect at the seafloor—layers that were buried along with the microbes colonizing them. Scientists have long debated whether these organisms beneath the Baltic Sea, as well as other bodies of water, are thriving and dividing or just barely surviving. A new paper in Environmental Microbiology Reports  suggests that deep microbes are doing just fine. Deep Life Community members Laura Zinke, Jan Amend (both at University of Southern California, USA), Jordan Bird, Karen Lloyd (both at University of Tennessee, USA), Bo Barker Jørgensen (Aarhus University, Denmark), and Brandi Kiel Reese (Texas A&M University, USA), along with Ian Marshall (Aarhus University, Denmark) and Megan Mullis (Texas A&M University, USA), analyzed Baltic Sea sediments to see what kinds of microbial activities occur at depths down to 42 meters below the seafloor. The researchers found that resident microbes are surprisingly active in this high-carbon, low-energy environment. 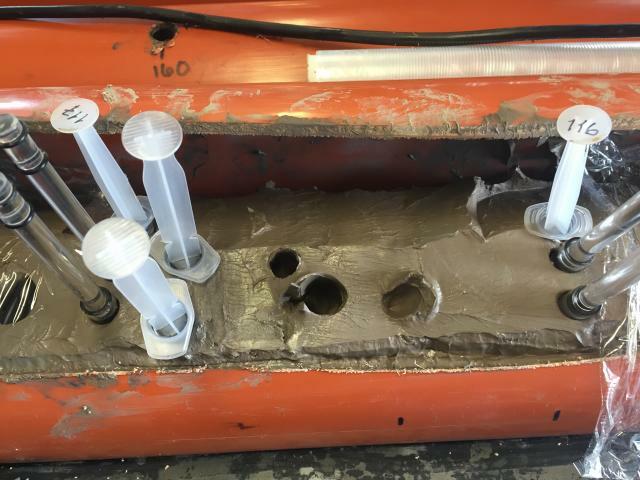 Scientists have studied microbes in the water column and surface sediments of the Baltic Sea, but it wasn’t until Expedition 347, a research cruise executed by the Integrated Ocean Drilling Program, that scientists had access to deeper sediments. Zinke and colleagues extracted and sequenced RNA from the cores of nutrient-rich, oxygen-free sediments collected during the expedition. Microbes transcribe copies of their genes into RNA, which serves as instructions for making proteins, so RNA is a good indicator of what genes are active and what functions the cells are performing. When the researchers analyzed RNA sequences from the core samples, they found that rather than dying slowly in the sinking sediments, Baltic microbes have adapted to their low-energy lifestyle. The detected genes indicate that microbes make a living through methane production and consumption, some sulfur cycling, and also dehalogenation, where microbes remove chlorine or bromine from organic compounds to release energy. The microbes in the Baltic Sea sediments are likely more active and more numerous than deep sediments beneath the open ocean. This difference is because the Baltic sediments have higher levels of buried organic carbon and are more representative of coastal sediments that receive runoff from the coast. With any sequencing study, however, Zinke cautions that there are sizable amounts of sequence data they can’t identify. “That’s especially true in the deep biosphere,” said Zinke. “Hopefully in 20 years we can go back and find out more.” Also, while detecting an RNA transcript is a good indication that cells have turned on a gene, the transcript alone doesn’t guarantee that cells have made protein, or at what rate a biological process might be occurring. She says that collaborations, like the DCO, are important for putting scientists together who can take different approaches to piece together exactly what is going on in the subsurface. Zinke said she was lucky to receive grants for sequencing from the DCO’s Census of Deep Life to support this work and enjoyed attending the second DCO Summer School at Yellowstone National Park. In her next paper, Zinke is analyzing the carbon cycling genes detected in the Baltic Sea sediments for processes like fermentation and metabolism of organic compounds.